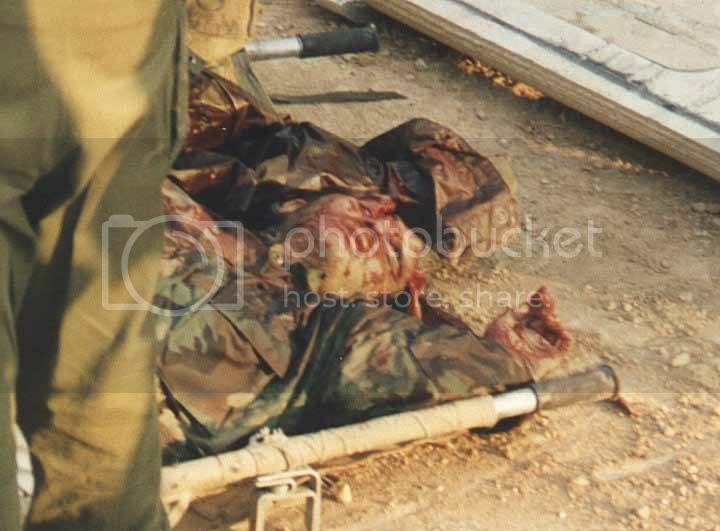 10 Years to ‘Ramallah lynch’ October 2000 – Animalism! | Free Israel! 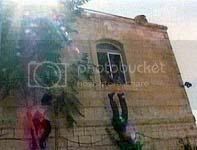 10 Years to ‘Ramallah lynch’ October 2000 – Animalism! THE TRUE FACE OF ARAB-ISLAMIC “Palestine” ANIMALISM! The day the world witnessed animalism on display, shameless inhumane revelations, by “average” Arab-Palestinians & their official police. * Two Israelis are nabbed –as they lost their way– by the “Palestinian” Police who beat them brutally. * They then handed over the men to a mob to lynch, while they watch the scene. * One “proud” Arab-Muslim “hero” had his hands covered in the blood of the Israelis and waved in a bragging manner through the window to the larger crowd anxiously waiting in the public square. 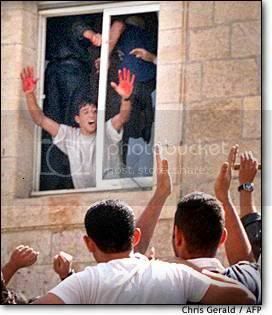 * An Israeli is thrown out the window into the bloodthirsty [literally] mob waiting. 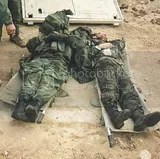 * Their bodies were mutilated the ‘mainstream’ Arab-Muslim “Palestinians” screamed in ecstasy, moaning in beasty manners while waving the body parts in “joy”… all that savagery in broad day light in public square. * Just like the Arab-Palestinian dancing, celebrating the 9/11 Islamic massacre of 3,000 innocent people, the PA [Pallywood] tried to suppress the lynch from the world, first they denied it, but as the photos shot by an Italian crew already [exposed their true character] shocked the world, they quickly switched gears and attempted to lie that the Israelis were nabbed on “suspicion of spying… or something. The lynching of: Vadim Norzhich and Yosef Avrahami. 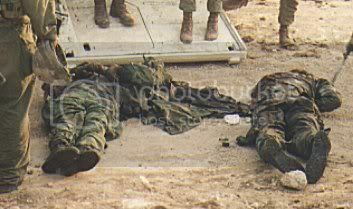 On October 12, 2000, two non-combatant Israeli.. were lynched and brutally murdered by a Palestinian mob in Ramallah. Both were drivers, one aged 38 and the father of three, the other a 33 year-old newly-wed. Since this lynching, the official Palestinian broadcasting stations have made every effort to hide the horrible pictures which were shown around the world. According to reporters’ evidence on the scene, not only did the Palestinian police not protect the two men slaughtered while in their custody in the Ramallah police station, but they also tried to prevent foreign journalists in the area around the building from filming the incident. Despite the attempts to distance reports, an Italian television crew managed to film several scenes. The following is an ad published in the Al Hayat Al Jadidah newspaper, considered the main newspaper of the Palestinian Authority. The ad, probably paid for, is evidence of the double standard which has come to characterize much of the reporting of the recent violence in the territories. Note that the brutal lynching is described merely as “the events”. “I had arrived in Ramallah at about 10.30 in the morning and was getting into a taxi on the main road to go to Nablus, where there was to be a funeral that I wanted to film, when all of a sudden there came a big crowd of Palestinians shouting and running down the hill from the police station. 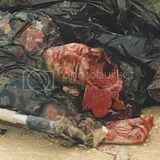 I thought he was a soldier because I could see the remains of the khaki trousers and boots. My God, I thought, they’ve killed this guy. 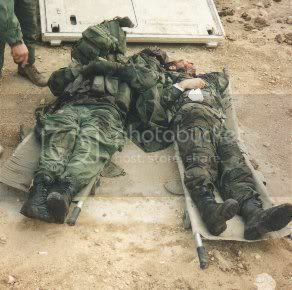 He was dead, he must have been dead, but they were still beating him, madly, kicking his head. They were like animals. I tried to get the film out but they were all grabbing me and the one guy just pulled the camera off me and smashed it to the floor. I knew I had lost the chance to take the photograph that would have made me famous and I had lost my favourite lens that I’d used all over the world, but I didn’t care. I was scared for my life. At the same time, the guy that looked like a soldier was being beaten and the crowd was getting angrier and angrier, shouting ‘Allah akbar’ – God is great. They were dragging the dead man around the street like a cat toying with a mouse. 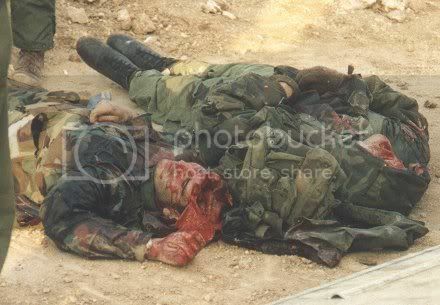 It was the most horrible thing that I have ever seen and I have reported from Congo, Kosovo, many bad places. 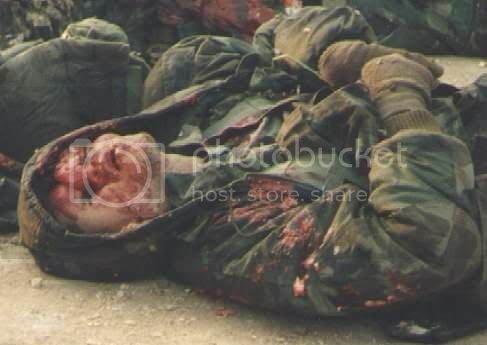 In Kosovo, I saw Serbs beating an Albanian but it wasn’t like this. There was such hatred, such unbelievable hatred and anger distorting their faces. The worst thing was that I realised the anger that they were directing at me was the same as that which they’d had toward the soldier before dragging him from the police station and killing him. Somehow I escaped and ran and ran not knowing where I was going. I never saw the other guy they killed, the one they threw out of the window. Arabs Lynch Jews at Ramallah. What Else Is New!Arabs are cruel and heartless butchers of Jews. For example, the Lynching at Ramallah. BBC NEWS | Middle East | Man jailed over Ramallah lynching Nov 22, 2004 … A Palestinian man who waved bloody hands at a cheering mob is jailed for the murder of an Israeli soldier. 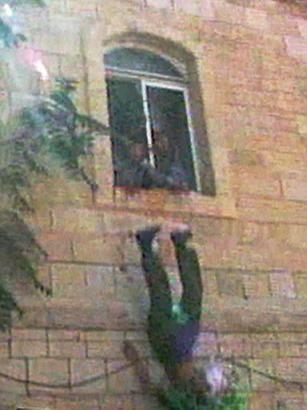 Last member of Ramallah lynch caught Sep 26, 2007 … Paratroopers arrest 36-year-old Tanzim terrorist who participated in murder of two reservists in 2000. Institute for Global Jewish Affairs – Global Antisemitism, Anti … … al-Dura,” “The Ramallah Lynch Omissions,” “The Never-Filmed Palestinian … the day two off-duty Israeli reserve… were lynched in Ramallah. In Ramallah in 2000, two Israeli soldiers were kidnapped, beaten, stabbed countless times, had their eyes gouged out, and were literally disemboweled and dismembered by an Arab lynch mob. The people – and I use the term loosely – who carried out the initial beatings threw one of the victims down to the waiting mob, where his face was further crushed with stones, feet, fists and even a heavy metal window frame. One Jew was set on fire and dragged along the street as Arab onlookers danced and cheered. Some of the butchers celebrated their crimes with the victims’ internal organs. 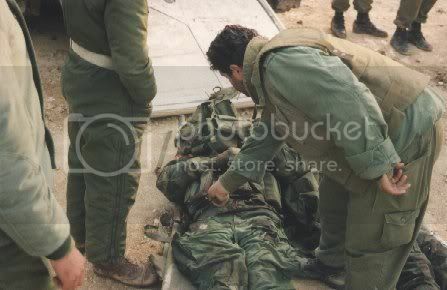 One of the killers, famously captured on film, proudly displayed his blood-soaked hands to the cheering Ramallah crowd. This is the enemy. Don’t look away. Perhaps when another rally is held in support of Iraqi “resistance” or “Palestinian liberation” somewhere in the world, counter-protesters can remind the ever-so-sensitive and progressive demonstrators of Nick Berg’s scream of pain, or of two-year-old Meirav Hatuel cowering in her car seat, or of the Ramallah or Fallujah savages dancing with human entrails. 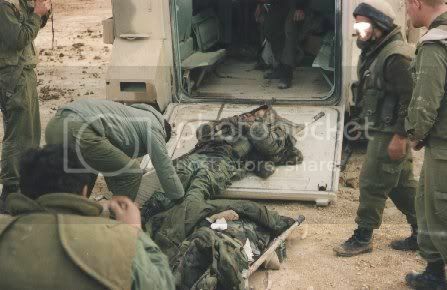 During the lynch of the two IDF soldiers who had taken a wrong turn into Ramallah in 2000, one of the Arab murderers paused in his savage beating to answer a cell phone belonging to one of the dying soldiers. This entry was posted on July 27, 2010 at 2:21 am and is filed under Uncategorized. You can follow any responses to this entry through the RSS 2.0 feed. You can leave a response, or trackback from your own site. I remember this as if it was yesterday. The degrading,and digusting actions dont get any easier.I hope and pray, for the families of Yossi&Vadim. Anyone who is an apologist for Palestinians, In my view, should be made to watch,and read about this infamy! God bless Israel.